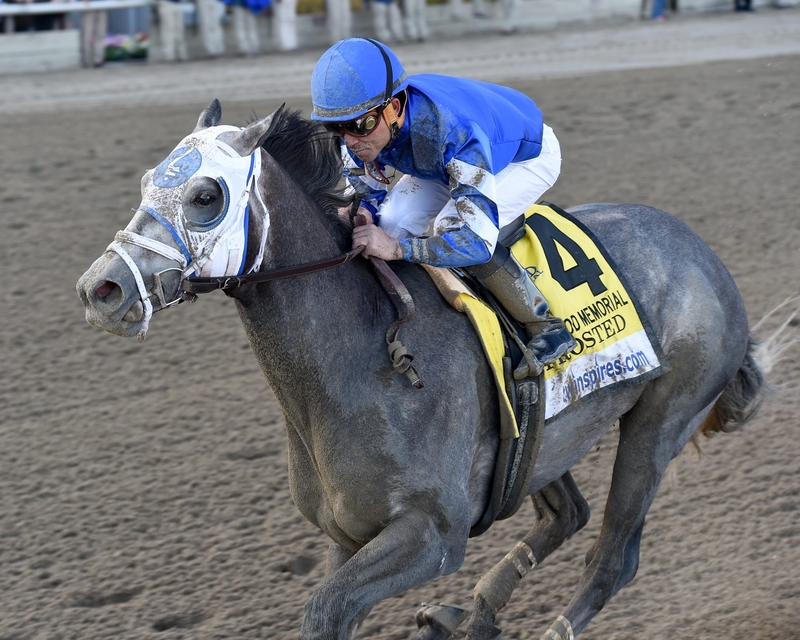 Frosted won the Wood Memorial at Aqueduct and could earn some money with possible odds in the 20-1 range for the Kentucky Derby. Gene Kershner’s Post Time: Who’s crashing this year’s Kentucky Derby party? In the last two editions of the Kentucky Derby a long shot has crashed the winning exacta and trifecta combinations. In 2013, it was 34-1 Golden Soul and last year it was the final horse to make the field, Commanding Curve at 38-1. Last year’s Derby $2 trifecta paid in excess of $3,400 and the 2013 exacta and trifecta bets paid $982 and $6,926, respectively, for a $2 wager. In the last four years, a 15-1 shot has crashed one of the top two spots. So who will be the high-priced colt most likely to crash the exotics in the 141st Run for the Roses next Saturday at Churchill Downs? There are several candidates that meet the qualities of those late-closing horses from the last two years with staying power that should be considered when they enter the gate in Louisville next Saturday afternoon that can boost your chances at a four-figure payday. While he may have finished as the colt with the most Derby qualifying points after winning all three preps at the Fair Grounds in Louisiana, International Star is projected to go off around 15-1 at post time. His pedigree suggests that he will handle the 10-furlong Classic distance without difficulty. International Star was sired by Fusaichi Pegasus, the 2000 Kentucky Derby winner, and his closing kick suggests that he’ll be coming late to pick up the pieces for third or fourth place. He is a must-use underneath on trifecta and superfecta tickets. Acquired by 79-year-old owner Ken Ramsey and his wife for $85,000, International Star is seeking to become the first New York-bred since Funny Cide to wear the roses. Ramsey, known for breeding horses to the champion turf horse Kitten’s Joy, loves his horse’s closing style. “In the last race he closed from seventh and won by a neck,” said Ramsey. “The time before that, he came from six-and-a-half lengths back and won by one. He’s closed every single time, except at Saratoga in the Anticipation race, which was a turf race, and I didn’t buy him to be a turf horse, I bought him for a Derby horse,” Ramsey said during a national media conference this week. Ramsey is praying he doesn’t draw the dreaded No. 1 post again this year. “I think if I don’t drill the one hole like I did last year with Vicar’s in Trouble that my horse will probably be in the superfecta. I’m not tapping him as the winner, but he’s a seasoned veteran, he’s already had nine races under his belt, and he closed eight out of nine times he’s run so far,” he said. Another horse not being mentioned in many circles that also could be in the 20-1 range is Frosted. The Wood Memorial winner progressed nicely after changing venues from Gulfstream back to Aqueduct, where he broke his maiden and finished second in the Grade 2 Remsen Stakes. He showed in the Wood that he could handle traffic weaving in and out of horses and take dirt to the face, two situations that will be faced while attempting to win the 20-horse Kentucky Derby. Trainer Kiaran McLaughlin couldn’t have scripted it any better. Frosted is owned by Godolphin Stables, a Darley home-bred of Sheikh Mohammed of Dubai. The Sheikh has made it no secret that he covets the Kentucky Derby based on the dollars he has spent searching for a horse that will bring him that title. Another New York-bred, Tencendur, is a late developing colt who could play the party crasher role on Derby day at odds exceeding 30-1. The second-place finisher in the Wood behind Frosted has a nice late kick and is rounding into form for trainer George Weaver. The 44-year-old trainer who learned the ropes from world-class trainers D. Wayne Lukas and Todd Pletcher will saddle his first Derby horse in Tencendur. He’s been known to win races at high odds during the summers at Saratoga and hopes his young colt will hit the board as this year’s bomb. Owned and bred by Playbill President and CEO Philip Birsh, the son of Warrior’s Reward has operated well under the radar including earning a 100 Beyer Speed Figure in the Wood Memorial. Manny Franco, who rode him in his maiden-breaker, will be aboard Tencendur next weekend under the Twin Spires. Bolo, the horse with the best turf pedigree in the field, could pull a Paddy O’Prado (third in the 2010 Derby) or Dullahan (third in 2012), both horses that had the same turf tendencies. He’s had two respectable finishes against the highly-regarded Dortmund in California with aspirations that his form will transfer to the dirt at Churchill Downs. The Derby is mostly about being able to get the mile-and-a-quarter distance and he certainly has the bloodlines to stay the 10 furlongs at Churchill. He’ll have one of Southern California’s top riders, Rafael Bejarano, in the irons. Bejarano’s best finish in the Derby was fourth on Papa Clem in 2009. Bolo will likely be in the 25-1 to 30-1 range on Derby day, so there will be balloons if he crashes the trifecta. Those are four horses that could easily be the spoiler of Derby 141, so keep an eye on their workouts this weekend and the gate they end up in during the post position draw set for next Wednesday on NBC Sports Network at 5:30 p.m.